In recent years, battery powered tool suitable for the construction industry have been developed. We now see battery power in a wide range of tools from construction to landscaping and beyond; all powered by batteries. 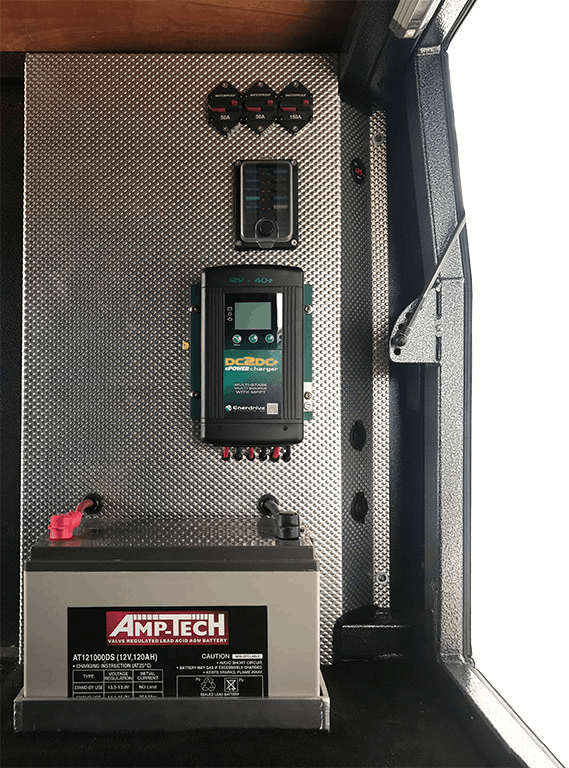 How do you keep your tool batteries at full charge while on the move? At Tong Metal we have created four solutions to meet your canopy electrical needs. The Tong canopy, Dual Battery System includes everything required for a comprehensive 12volt dual battery system: LED lights and 12 volt power using a 120 Amp Hour AGM Battery. An Anderson Solar Connector is also provided. Dimple Plate Electrical Wall Panel. 120 Amp Hour AGM Battery. 1 x DC2DC Smart Battery Charge<. 2 x LED White/Yellow, Dimmer Enabled Switch (1,000mm). 1 x Dual USB Sockets. 1 x LED Volt Meter to manage the state of charge. 1 x Anderson Kit (Car to camper connection kit). 1 x Anderson Connector – to connect to the vehicle. 1 x Anderson Solar Connector – Ready for a folding solar panel. The Tong camper, Traveler System takes the comprehensive 12volt dual battery system to the next level: more lights and more power using a 200 Amp Hour AGM Battery. This system also includes a battery monitor plus an Anderson solar connector. 200 Amp Hour AGM Battery. 1 x DC2DC Smart Battery Charge. 2 x Dual USB Sockets. Power: You want even more power; the Trade Power Advanced System is what you need. 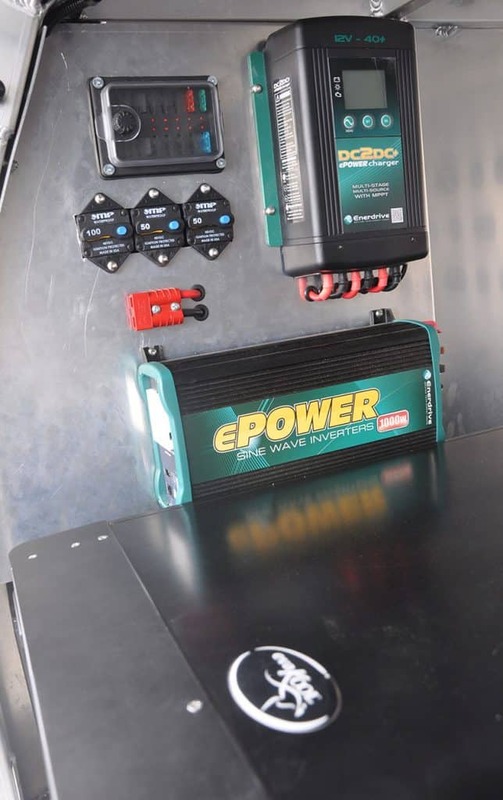 This ultimate system includes a 200 amp hour Lithium battery, a 2,000w inverter and 200 watt solar panel. With this system, you can use the power of the sun to keep your tool batteries charged. And if you need to pull out the big tools, you have 2,000 watts of 240 volt sine wave power at your fingertips. Security: Now all this power and you tools are expensive and need to be kept secure. So we have included security and safety into the Trade Power Advanced System; you also get central locking and open door alarm. 200 amp hour Lithium Battery. Central locking for two doors including remote fob remote control. Door open alarm for two doors. Fixed Solar Panel (SP-EN100W or SP-EN200W) You have installed either the Canopy Dual Battery or Trade Power System and would like to add a matched fixed solar panel. 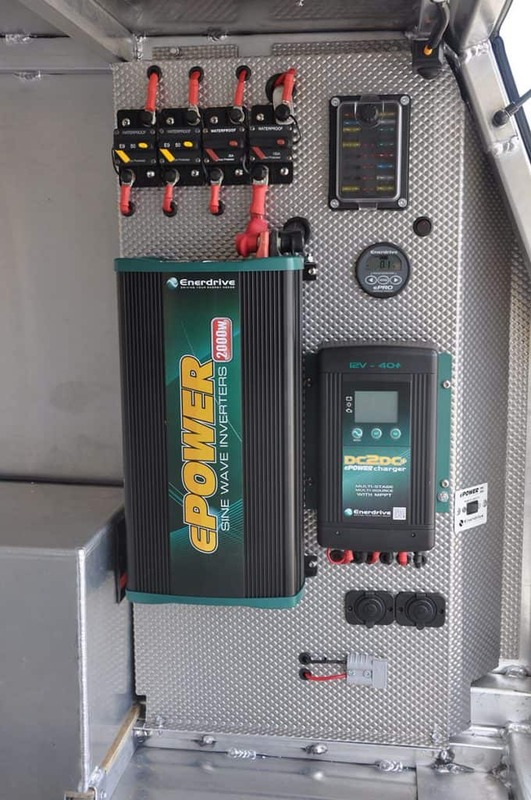 The Enerdrive standalone, fixed solar panel is the solution. The panel can be installed onto the roof of your canopy and wired into you DC2DC charger. Enerdrive 160W Folding Solar Panel Kit (SPF-EN160W) Enerdrive offers a great Folding Solar Panel Kit to keep your battery and 12 volt equipment charged from the sun. The 160 watt mono-crystalline folding panel kit (Im 8.61amps) is easy to stow and carry. When you arrive at your destination, unfold place in the sun and connect to your camper via the red Anderson solar connector. Central Locking Security The introduction by Tong Metal of the 3-point locking system including framed doors significantly increased the security of the Tong tool boxes and canopies. This new design tool boxes and canopies make them highly suited to central locking. Door Open Alarms Almost weekly we see a canopy returned with a damaged door; the door was left open when the vehicle was moved and the door has caught a tree, post, wall or similar object. We can replace damaged doors, but the best option is to prevent the accident from occurring. We now have available an “Open Door” alarm system. If you leave a canopy door open and turn on the vehicle ignition, a loud alarm will be triggered to remind you to stop and close the door.